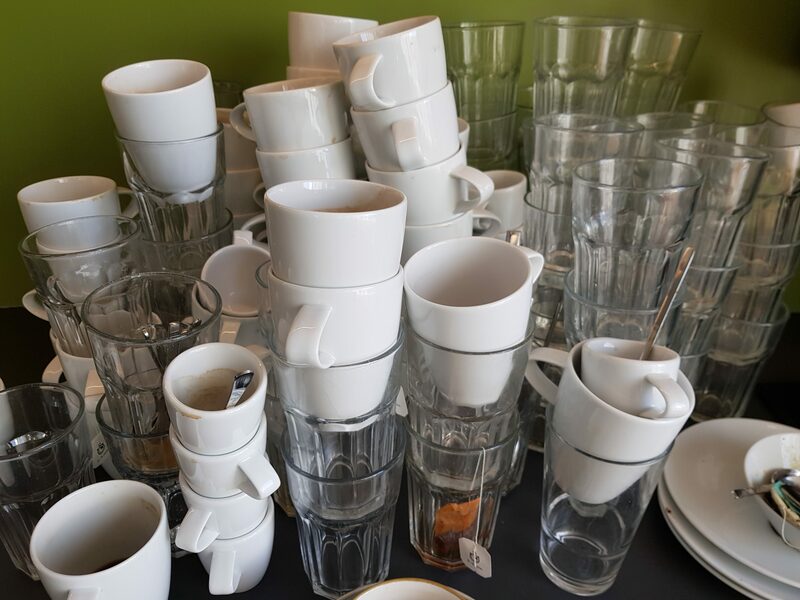 Many offices suffer from people not cleaning their dirty dishes after using them or not putting them where they would be cleaned (i.e., dishwasher). Big stacks of used coffee cups litter the shared kitchen. In most cases there are a few people, let’s call them the do-gooders, who take care of this. They feel responsible for having a nice and adequate workspace. So they clean, but the mess frustrates them. More than anyone else, because while others just have a short glimpse at it, they spend time and effort taking care of it. Frustration often leads to aggression, so the communication is rarely constructive. By putting up signs that insult people, by yelling around how lazy/disgusting others are or by dictating some kind of process. Statements might become passive aggressive or simply soaked with frustration. Because it’s usually done by people that suffer from the situation, but can’t help and fix it. And yet, many people seem not to be aware of the root for the problem. But first things first, who are those people that cause the mess in the kitchen? Let’s call them filthy pigs for now. Who are they? It’s THEM! Not ME. Okay, yesterday, I didn’t put my cup into the dishwasher, but I was in a hurry. Usually I do it. Well, often. But other cups have been there before! Most conflicts emerge from judging the personality of people based on behavior in very specific situations, which we usually don’t know much about. So we ignore the situation, yet generalize on the behavior. It is called the attribution bias. In our scenario here, the do-gooders judge all people who do not do as they do. The implicit message is that those can’t be good people. And everyone agrees. Even people that stack up their cups. Because the filthy pigs are bad people, but I am not, because I had a specific reason, and it was an exception anyways. Hence a person is a filthy pig due to a situation they’re in and not due to their personality. It’s the anonymous mass of people we’re dealing with. To recognize this is very important. Because this also means that everyone, including the do-gooders, is an imminent filthy pig. Everyone who potentially could add to the mess, no matter how likely. Every problem has a cause and an effect. Sometimes you can’t solve the disease without treating the symptom as well. So before we’re talking about the underlying problem, let’s look at its effect and how to deal with it: The kitchen is messy. We already have established that a messy kitchen is not the result of bad people, but an accumulation of bad situations. When we take the decision whether or not to do something, there are a gazillion different factors that play a role. And most decisions are not even being taken consciously. So the question is, what makes me add to the mess in the kitchen and not help avoiding it? The kitchen thing usually kicks in, when you’re on your way home. You are in some kind of hurry and your mind is already far away from the office. Then you see the mess. Do you know how to turn on the dishwasher? Probably not. And it would take a moment to figure everything out and find the soap and what not. That’s effort. It might seem small, but it’s there. And it’s a good reason for our brain to exit out. Especially when there are other dishes piling up already. There is probably a reason for that, we assume, add our cup, and off we go. Structured solutions, so approaches that doesn’t involve some people swearing at others, include hiring a kitchen service or assigning the staff for kitchen self-service. The former helps dealing with the symptom, but it is avoided by cheap management, that doesn’t want to invest into their people. The latter is a sign for hierarchical command-and-control management. And then there is the penalty approach, of course. Each of those act on the surface. Not every office kitchen is messy. When looking at those that are not, it becomes vivid that there is a fundamental difference: Size matters. It appears, that a kitchen tends to be cleaner, when it is being used by a smaller group of people or by people that are closely collaborating. The larger the group, the more mess. Why is that? Group dynamics play a major role in social psychology. All human beings want to be part of groups. We need the recognition by others, the interaction and communication with each other. Humans behave differently in different groups, we act according to the standard of the specific groups. These standards are what we call culture (if you want to find out more about human needs and dysfunctions in teams, read this: A Lack of Ownership). We also show behaviors to defend the “pack”. The group is important to us, hence we invest effort to increase the overall happiness or avoid unhappiness. We’re willing to invest quite a lot for our group. However, this logic only applies for group members who we accept as peers. If we feel superior to them, we don’t necessarily want to invest effort for them. The definition of a group in that sense is somewhat fluid and context-dependent. The stereotypical traditional husband doesn’t worry about cleaning dishes, because that’s the responsibility of the wife in his mind (Disclaimer). Same for the child in puberty and its parents. This doesn’t even involve active decisions, it is sub-conscious behavior, having to do with our self and our role in society. Or, to be more precise, our perception of it. So, people are willing to take care of the cleaning for others, if they believe that it helps the group they value. Hence the cleaner kitchens in smaller offices or workspaces with closer collaboration. The lower the amount of colleagues, the more likely it is that you feel connected to them. That also means, that when you don’t feel so connected with others, you’re not so willing to invest effort for them. Let’s take it to extremes: Would you do the dishes for people you have never seen before and without any return? In some offices there are around 100 people sharing a kitchen. Sometimes even more. Psychologists say that you can maintain relationships around 150 people (Dunbar’s Number). The rest are basically names you remember. Your family and friends aside, when you share your office kitchen with large amounts of people, there are many involved, whom you hardly ever talk to. The key here is the culture. Because when you think about it, THEY are still US, as we’re all colleagues. Or shared kitchen users. So the culture here could help us out. If the culture is a social-oriented one, people take effort to support others. The idea behind this is that you benefit from other people’s effort and “pay” by investing effort yourself. So everyone invests effort and everyone benefits from it. Most welfare systems are based on this thought. These systems are doomed though, when the culture becomes less collectivist and more individualist. When people start calculating their benefits, they try to maximize on the system. Those people are then less likely to clean the kitchen. And the result is a clash of cultures. On one hand people who work for the community, and on the other hand those who benefit from it. Now, cultural differences are normal. We’re never fully aligned with each other. But there’s a point where everything falls out of balance. That’s when the do-gooders express their frustration about the filthy pigs, not realizing, that their understanding of the current culture is terribly outdated. They feel like the reality is not what it’s supposed to be. Just to be crystal clear about this: When you perceive your kitchen as too messy, you probably have a culture problem. There’s a lack of unity. So, how to fix it? A living culture needs to be re-negotiated. Continuously. It also needs to be understood. More often than not there is a variety of different assumptions towards expected behavior. Spelling out the culture is crucial. Define common ground. Agree on it. Get people aboard. With a mutual understanding of a culture, you’re turning a THEM into an US. The key element is that a culture can’t be ordered by others (no, not by superiors either). Leadership creates followers, and followers do as their leaders do. If leadership believes the culture doesn’t apply to them, the culture is dead. If leadership lives a culture, others will, too. It’s crucial to understand reworking the company culture as change management, because that’s what it is. And yes, hiring kitchen service will help with the kitchen problem, that’s a valid choice. You might want to assess the level of collectivism in your organization though, and whether that is how you want it to be. Yes. I wrote 3 pages about people not taking care of a messy kitchen. I think we’re very bad in understanding the problems around us. And this is a very good example for not digging deep enough. It’s not about dirty dishes. It’s about people. If you contribute to the mess you’re part of the problem. People need to be held accountable for wrong doing, or making messes. If you litter you can be fined for your actions. Similar accountability can take place in an office environment. Perhaps the problem employees will be banned from the kitchen or have to clean up after others for a length of time. Maybe they’ll be shown the door and they can work at a company with other “filthy pigs” where they fit in better. Are you forgetting these superiors are the people who hire group members and determine the company culture either consciously or inadvertently? Real leadership doesn’t create lemming followers. Hi Rob, thanks for your response. You’re absolutely right, you can order a mess-free kitchen and punish everyone that doesn’t obey. That works. However, this will make any form of open, free and creative office space impossible, which is what I am looking for. Culture is not an excuse for anything. And setting expectations towards people is absolutely crucial for everything in any successful work environment. But if you have the expectation that people just follow orders from their leadership, then that’s what you’ll get. The fundamental ideas of servant or transformational leadership are very different from that. You want to lead people to feel accountable, where everyone has the same expectations of a mess-free kitchen. That is the opposite of lemming-followers, which is what you create by strict punishment.